“The Artists’House” is waiting for you! It is a Bed & Breakfast situated at Villa Maritati De Cesario in Gallipoli, Lecce, Italy. It is an old small villa in the town centre built in the 1950s and now fully renovated. It houses Giorgio De Cesario’s studio and a permanent exhibition of his works, but it is also a B & B equipped to receive artists from all over the world who want to exhibit here their works and, at the same time, spend a delightful holiday. 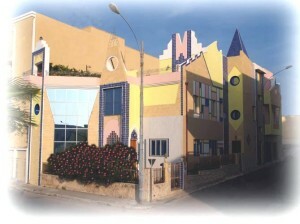 “The Artists’ House” has got four rooms and two suites, all of them with bathroom . Each room or suite is named after famous artists of the past such as Mondrian, Van Gogh, Leonardo, D’Annunzio, Canova, Bach. The suites overlook the wonderful sea of Gallipoli and all the guests can use a comfortable terrace where they can have breakfast, chat, read, sunbathe, paint, write or watch, for example, Santa Cristina’s fireworks, one of the most important summer events. The owners Giorgio and Maria Cristina De Cesario are looking forward to seeing you !!!! !